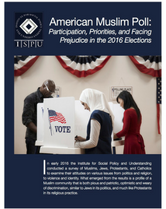 American Muslim Poll 2016: Participation, Priorities, and Facing Prejudice in the 2016 Elections offers a timely and groundbreaking look into the American Muslim community. In the years after the September 11th attacks in America, Muslims have been the subjects of frequent discussions but seldom among the participants. This attention often increases around elections as some political leaders use identity politics in their discourse and their policy proposals to target Muslims, as happened in the Ground Zero mosque discussions during the 2010 midterm elections, and the calls to close down mosques and ban all Muslims from entering the United States during the 2016 presidential campaign. The Institute for Social Policy and Understanding (ISPU) offers a badly needed evidence-based contribution to this highly charged and often misinformed national conversation. Muslims were surveyed not as isolated specimens, but within the context of their country's faith landscape, along with Jews, Protestants, and Catholics. The survey examines the attitudes of these American faith groups on various topics from politics and religion, to violence and identity. What emerges is the profile of a Muslim community that is both pious and patriotic, optimistic and weary of discrimination, similar to Jews in its politics, and much like Protestants in its religious practice.